One great reason to attend spring training: you have the time to see as much baseball as humanly possible. If you’re like us, that means scheduling doubleheaders throughout the trip. Here’s some advice as you build your own 2019 spring training doubleheaders in Arizona. Believe it or not, there are some scheduled doubleheaders in spring training—just not very many. In 2019, the Texas Rangers have a day-night doubleheader set for Surprise Stadium on March 11, with two separate tickets. But they are rare, to say the least: you just don’t see them often. Of course, the easiest way to see two games a day is to set up your own schedule. Here we look at Cactus League doubleheaders; earlier this week we reviewed some notable potential Grapefruit League doubleheaders. There are two ways to set up your own Phoenix-area doubleheader: schedule two MLB spring-training games or combine a college game with an MLB game. In Florida, given how spread out the complexes are, scheduling two MLB spring-training games in a day is a challenge, to be sure. That’s why we discussed a day at an MLB game and an evening at a college game. In Phoenix, we have the opposite issue: there are only two major college programs in the Valley of the Sun, and plenty of opportunities for day-night MLB doubleheaders. In general, we don’t recommend heading from one side of the Valley to the other in rush-hour traffic: you’ll be spending a great deal of time in the car. That’s why we say you should set up an MLB doubleheader either in the West Valley or the East Valley and avoid horrendous traffic. On the east side of the Valley are five more venues within decent proximity: Tempe Diablo Stadium (home of the Angels), Sloan Park (home of the Cubs), Scottsdale Stadium (home of the Giants), Hohokam Stadium (home of the Athletics) and Salt River Fields at Talking Stick (home of the Diamondbacks and Rockies). This is old-school Phoenix, with Tempe and Scottsdale providing plenty of diversions, nightlife and fine dining. Again, these venues are within an easy drive, and while we don’t yet have all the game times for these teams (the Cubs and Athletics, notably, have not announced), there are still plenty of day/night opportunities on the Cactus League schedule, though not as many as in the West Valley. Luckily, there is one venue in the East Valley tailor-made for a day-night doubleheader: Phoenix Municipal Stadium, home of Arizona State University Sun Devils. A longtime spring home of the Giants and Athletics, the Muni became the fulltime home of the Sun Devils when the A’s moved to Hohokam Stadium, and the program has prospered there. If you visited the Muni during the end of the Athletics’ tenure, you’ll find a few changes (less green and yellow, more burgundy and gold), but the place is largely unchanged. Phoenix Muni is a great candidate for a day-night doubleheader because the Sun Devils schedule most weekday games at night and the location (right on the edge of Phoenix, with Tempe directly to the south) is very accessible for any of the East Valley camps. And a night game at Phoenix Muni is a treat, with the sunsets reflected in the nearby Papago Park peaks often spectacular. Here is the 2019 ASU Sun Devils schedule. Arizona State University isn’t the only major college in Phoenix: last year Grand Canyon Universityunveiled a new on-campus ballpark that instantly became one of the best fan facilities in the country. GCU is located in Phoenix, not that far from Maryvale Baseball Park, so you can always combine a day game with the Brewers and a night game at GCU Ballpark. White Sox and Cubs fans may want to check out a visit by Illinois baseball; USC, TCU and Xavier are also notable visiting opponents. Here is the 2019 CGU schedule. This article originally appeared in the Spring Training Online newsletter. Are you a subscriber? 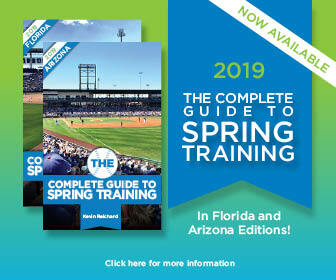 It’s free and contains plenty of spring-training information. Click here for subscription information.